By adhering to the highest compliance standards, we ensure legal and ethical behaviour across the Group. Our Code of Conduct (the “Code”) is one in a series of documents governing the organisation and management of our company. It sets the framework and defines the basic legal and ethical compliance principles we adhere to globally. 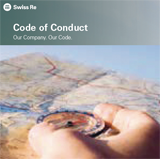 The Code is built on the five Swiss Re values, which guide us in making responsible decisions and achieving results using the highest ethical standards: integrity, team spirit, passion to perform, agility and client centricity. The Code also offers practical guidance and examples for deciding the appropriate course of action and solving ethical dilemmas. It further sets out how all employees should react when they observe a possible breach of the principles in the Code. All employees are obligated to uphold both the letter and spirit of the Code and the Group’s corporate governance principles in their daily business activities, and to respect and obey applicable laws and regulations in all jurisdictions where we do business. We regularly review and update the Code to reflect changes in regulations and principles. An overhauled version that includes a new layout and real-life examples to provide clearer guidance for day-to-day business situations was published in the second half of 2016. The Code is supported by detailed policies and standards that document Swiss Re’s requirements in line with applicable laws and regulations. It is available to our employees in eight languages: English, French, German, Italian, Japanese, Portuguese, Slovak and Spanish. The Code addresses our position on bribery and corruption. It clearly states that “we conduct business fairly without accepting or offering benefits intended to improperly influence decision-making”. The Code is supported by our Global Policy on Financial Crime and our Global Standard on Anti-Bribery and Corruption, which emphasise that bribery, facilitation payments and hospitality where the giver is not present are always prohibited. For gifts, hospitality, sponsorships and charitable contributions, the policy and standard specify the correct procedures to be followed, including dealing with public officials and making entries in the gift and hospitality register. We could not work successfully with our business partners, clients and individual consumers around the world without maintaining their trust for the data they provide to us. The Code highlights that we need to handle personal data with greatest care and use it only for legitimate business purposes. Our Data Protection Compliance Framework, with global as well as local policies and standards, addresses our commitment to protecting personal data and respecting privacy rights across our operations. We use internationally recognised data protection and privacy principles that ensure compliance with a complex and constantly changing set of laws and regulations, and we provide proper training and awareness sessions to our employees. Procedures for reporting security incidents and notifying on data breaches are established. We also contribute thought leadership on data protection by conducting expert sessions during insurance industry events and by hosting events through the Swiss Re Institute that look at the future of regulations, new technologies, digitalisation, cross-border data processing, big data and innovation in life and health insurance. The Code draws attention to the risk of becoming unintentionally involved in money laundering and emphasises the importance of due diligence. Our Anti-money Laundering Standards set out in detail key principles and guidance in relation to our anti-money laundering and counter terrorism financing efforts, including due diligence obligations concerning “know your counterparty”, counterparty and politically exposed persons (PEP) screening and the reporting of any suspicious activities. The Code includes our formal commitment to sustainability and human rights, providing a guiding principle for our efforts to act as a responsible company. There are several ways in which alleged violations of the Code can be reported, both by internal and external sources. For our employees, the options are described in the Code and include a whistleblowing hotline, which they can use anonymously (where legally permitted) or with identification. The hotline is operated independently by an external vendor and includes translation services into numerous languages. All new permanent and temporary employees joining Swiss Re must undergo mandatory eLearning training on the Code, focusing on ethical behaviour in accordance with the principles of the Code and its relationship to Swiss Re’s values. Completion of the training is tracked and instances of non-completion are escalated until resolution. All permanent and temporary employees complete a periodic Code of Conduct Acknowledgement. In addition, we have offered tailored trainings to employees that are particularly exposed to certain compliance risks, eg on antitrust and fair competition, insider trading, licensing & permanent establishment. Third parties representing Swiss Re – such as consultants, intermediaries, distributors and independent contractors – should be carefully selected and need to comply with the Code and relevant policies. When we work with such third parties, we provide them with information about the relevant requirements and, in the event of any infringements, take appropriate action, up to and including terminating a contract. In the second half of 2017 we launched a Policy Management Tool as a central place for finding all Swiss Re policies and standards. In addition, we simplified the architecture of our Global Policies so that they are short and use simplified language and a consistent structure to make them easy to read and understand. There are a reduced number of Global Policies (eight in total) that contain highlevel principles all employees have to be aware of, beyond the principles set out in the Code of Conduct. Where necessary, underlying Standards are in place to provide additional detail on the Code of Conduct and the Global Policies.